# 856 new registered N856FA - Pilatus PC-6/B2-H2 # 856, former 3G-EM of Austrian Air Force, is new registered in the US as N856FA operated by Glacier Fly Alaska and owned by Plane Fun Inc TR Trustee. The Turbo Porter also received a new look with painted animals of Alaska. # 631 new registered F-HYNE - Pilatus PC-6/B2-H4 # 631, former G-BYNE, is new registered in France as F-HYNE but still owned by ASD operating at Namur (Belgium). So far this is now the 7th country # 631 has been registered! F-GFFD accident - Pilatus PC-6/B2-H2 # 708 F-GFFD of CERPS de Nancy-Loraine has been substantial damaged in a landing accident at Nancy-Azelot airfield. The pilot is unhurt. HB-FBY (2) cancelled - The factory new PC-6/B2-H4 # 1014 HB-FBY (2) has been cancelled in the swiss aircraft register following its delivery to AMA as PK-RKE. 74-2079 accident - Fairchild AU-23A # 2079 74-2079 of the Royal Thai Air Force has been substantial damaged today during an emergency landing after an engine failure. The three occupants suffered minor injuries. The Turbo Porter looks to be a written off. # 964 new registered T7-LVN - Pilatus PC-6/B2-H4 # 964, former ZS-PCS, is new registered in San Marino as T7-LVN operated by Endeavour Aviation in Ivory Coast. The Turbo Porter is joining the sistership TU-GET in the fleet. F-GMEL new owned by Blue Aero - Pilatus PC-6/B2-H2 # 536 is now owned by Blue Aero. The Turbo Porter is actually under overhaul and will receive a new painting before entering service with CERP de Lens. New PC-6 frame at DMTC - The Fairchild PC-6 frame ex 1601 # 2030 marked as HS-DMTC at the Don Muang Technical College in Thailand has been replaced with Fairchild PC-6 ex 1605 # 2063. It was gifted by the Royal Thai Police to the DMTC for instructional use. HS-DMTC is current in storage at Mae Ka Tai. FAP-331 in a new look - Pilatus PC-6/B2-H4 # 722 FAP-331 of Fuerza Aerea del Peru is flying now in a new grey look after a complete overhaul - video. HS-EFS upgraded to B2-H4 - Fairchild PC-6/B2-H2 # 2026 HS-EFS of Thai Sky Adventures has been repaired and upgraded to B2-H4. The Turbo Porter is expected to return to service in April/May 2019 fitted as well with a -34 engine, Beringer wheels & brakes and an MT 4 blade propeller. # 916, 705 and 629 with new ownership - Pilatus PC-6/B2-H4 # 916 former 9Q-CZG, PC-6/B1-H2 # 705 former EC-JOE and PC-6/B2-H2 # 629 former D-FDFF are now all owned by Thai Sky Adventures. # 916 is present under rebuild and will be fitted with a -34 engine, Beringer wheels & brakes and an MT 4 blade propeller. F-HBSF new owned by Aviofun - Pilatus PC-6/B2-H4 # 949 has been sold today from Avialec to Aviofun in Slovenjia. The Turbo Porter will keep it's french registration. F-HDSA with new owner - Pilatus PC-6/B2-H4 # 931 F-HDSA is new owned and operated by ATC Aviation based in Vannes. HA-YDE sold to Portugal - Pilatus PC-6/B2-H2 # 814 has been sold to Portugal. The last of 4 PC-6's once registered in Hungary left the country on 22-Nov-2018. New aircraft # 1014 - The factory new PC-6/B2-H4 # 1014 is registered now as HB-FBY (2) with Pilatus Flugzeugwerke AG. The Turbo Porter is painted in AMA colors and will be registered PK-RKE. # 1013 new registered N122DM - Pilatus PC-6/B2-H4 # 1013, former HB-FBX (2), is new registered in the US as N122DM operated by g-unlimited GmbH and owned by Dimor Aerospace Inc. The Turbo Porter will be set on floats and will be used later in Brazil for ambulance flights. A second machine will follow. HB-FBX (2) cancelled - The factory new PC-6/B2-H4 # 1013 HB-FBX (2) of Pilatus Flugzeugwerke AG has been cancelled in the swiss aircraft register. # 551 F-BTCG written off - Pilatus PC-6/B2-H2 # 551 F-BTCG of CEPS de Besancon Franche Comte had a landing accident during a maintenance test flight on 16.03.18 at Grenoble. The Turbo Porter, one of the 20 oldest flying PC-6, had to be written off and will be used for spares. # 1004 new registered TU-GET - Pilatus PC-6/B2-H4 # 1004, former Pilatus demonstrator HB-FJI, is new registered in Ivory Coast as TU-GET operated by Endeavour Aviation. This is the first PC-6 registered in Ivory Coast which marks the eightieth country a PC-6 was ever registered. New aircraft # 1013 - The factory new PC-6/B2-H4 # 1013 is registered now as HB-FBX (2) with Pilatus Flugzeugwerke AG. TG-ASC with new ownership - Pilatus PC-6/B2-H4 # 858 TG-ASC is new owned since earlier this year by Adonai International Ministries. The Turbo Porter will be used as eminency support and transportation for a small hospital in the mountains of Guatemala. # 909 new registered F-OPCB - Pilatus PC-6/B2-H4 # 909, former S9-LOL, is new registered in Reunion Island as F-OPCB with the Para Club de Bourbon. The ferry flight took 46h15 for 6 stages: Gap / Heraklion / Djibouti / Nairobi / Mayotte / Reunion Island - more or less 9'700 km. F-GKIA in a new look - Pilatus PC-6/B2-H2 # 689 F-GKIA of Fly 2 Sky GmbH is flying now in a new grey "shark" livery. # 810 new registered in Germany - Pilatus PC-6/B2-H4 # 810, former EI-IAN, is new registered in Germany as D-FANO. The Turbo Porter - after fresh 14 years inspection and new engine - is owned by Sky Lease GmbH & Co.KG and is designed for operations within Europe. # 931 new registered in France - Pilatus PC-6/B2-H4 # 931, former N7995D, is new registered in France as F-HDSA. The Turbo Porter is owned by Flamingos Express and is leased to ATC Aviation for operations at Vannes. HS-WTF with great livery - Pilatus PC-6/B2-H4 # 963 HS-WTF of Thai Sky Adventures Co Ltd is currently prepared to fly in a fantastic bubbles look in the thai national colors. # 909 new registered in Sao Tome - Pilatus PC-6/B2-H4 # 909, former TR-LOL, is new registered in Sao Tome as S9-LOL. The Turbo Porter will replace F-OIPB of the Para-Club de Bourbon on Reunion. F-HIHA with new ownership - Pilatus PC-6/B2-H2 # 561 is new owned by Immobilieree et Industrielle Wantiez and is flying now at the DZ in Amiens-Glisy. F-HMTA with new ownership - Pilatus PC-6/B2-H4 # 860 is new owned by Pau Parachutisme Passion and is flying in a revised livery at the DZ in Lasclaveries. HS-EFS accident - Fairchild PC-6/B2-H2 # 2026 of Thai Sky Adventure Co Ltd has been substantial damaged in a landing accident on 20-Feb-18 at Nong Khor Airfield. # 791 purchased by STV Aviation - Pilatus PC-6/B2-H4 # 791, current registered as S5-CMA, has been purchased by STV Aviation GmbH and will be operated from March at Schlierstadt Southsidebase. 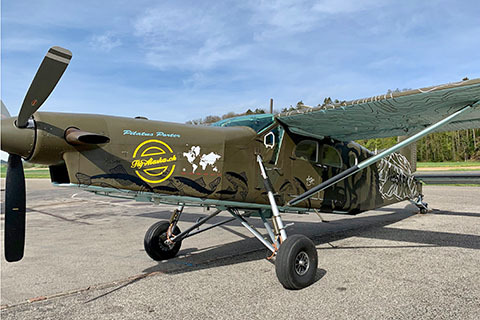 # 752 with new ownership - Pilatus PC-6/B2-H4 # 752 N752AK is new registered to Stefenelli Aviation N-TR Inc Trustee and will be operated by Skyservice Altmühltal flying for skydive colibri at Thalmässing-Waizenhofen. F-GEEO in a new look - Pilatus PC-6/B2-H2 # 676 F-GEEO of Altitude Sud SARL is flying now in a new blue-white livery. HB-FLA in a new look - Pilatus PC-6/B2-H4 # 905 HB-FLA of Scenic Air AG is flying now in a new fresh livery. # 978 purchased by MG Air Inc - Pilatus PC-6/B2-H4 # 978, former registered PR-AJJ as the only PC-6 in Brazil, has been purchased by MG Air Inc and is now registered in the USA as N584MA. The Turbo Porter will be based in Concord CA. F-GIXX with new ownership - Pilatus PC-6/B2-H2 # 564 is new owned by Bassin Aviation at Arcachon. # 863 purchased by Aviofun - Pilatus PC-6/B2-H4 # 863, former registered JA61TC as the only PC-6 in Japan, has been purchased by Aviofun. The Turbo Porter has been shipped to Slovenia and will be new registered S5-CMD. GN-805 modified to B2-H4 - Pilatus PC-6/B2-H2 # 787 GN-805 of Gendarmeria Argentina has been modified to a B2-H4 version by Pilatus Aircraft at Stans. EC-EMZ accident - Pilatus PC-6/B2-H2 # 672 EC-EMZ of JIP Aviachio has been damaged in a landing accident at Empuriabrava. The pilot who was alone on board is safe. F-GOMB with new ownership - Pilatus PC-6/B2-H4 # 819 is new owned since October by Arcachon Parachutisme EPSBA. # 963 new registered in Thailand - Pilatus PC-6/B2-H4 # 963 has been cancelled in the US register as N963FP of Jim Perry following it's sale to Thailand. The Turbo Porter, equipped with a 0 time -34 engine, MT 4 bladed propeller and Beringer wheels & brakes, is new registered as HS-WTF to Thai Sky Adventures Co Ltd and will fly on their dropzone as "Skydive 2" from January 2018 joing the sistership HS-EFS which will shortly be overhauled and upgraded to H4 status. # 792 new registered in the US - Pilatus PC-6/B2-H2 # 792 has been cancelled as ST-0602 of Satuan Udara Pertonian and is new registered as N108MA with Pleasant Aviation LLC. # 785 new registered in the US - Pilatus PC-6/B2-H2 # 785 has been cancelled as ST-0601 of Satuan Udara Pertonian and is new registered as N22MA with Pleasant Aviation LLC. 6 PC-6 for Asian Express - The factory new Pilatus PC-6/B2-H4 # 1006, 1007, 1008, 1009, 1010, and 1011 had been cancelled in the swiss aircraft registers. All aircraft are new registered in China with Asian Express General Aviation Wuxi Co Ltd.
# 1012 new registered in the US - Pilatus PC-6/B2-H4 # 1012 has been cancelled in the swiss aircraft register as HB-FBW (2) of Pilatus Flugzeugwerke AG and is new registered as N488WY with Flexible Flyer LLC. The Turbo Porter started it's delivery flight from Buochs via Prestwick on 21-Sep-2017. HB-FLI modified with a PT6A-34 - Pilatus PC-6/B2-H4 # 893 HB-FLI of Flying Devil SA has been modified with a new PT6A-34 turbine. The Turbo Porter is now needing 3 minutes less to full altitude. 17 minutes by warm weather to 4200 above ground level with 10 jumpers and respecting noise restrictions. New aircraft # 1012 - The factory new PC-6/B2-H4 # 1012 is registered now as HB-FBW (2) with Pilatus Flugzeugwerke AG. This Turbo Porter is painted in an entire new color scheme for the PC-6. HB-FKR sold to Germany - Pilatus PC-6/B2-H4 # 872 is new owned by Sky-Business Rent GmbH & Co.KG and will receive the registration D-FACE. N752AK is painted now - Pilatus PC-6/B2-H4 # 752 N752AK of Flyalaska.ch Gmbh is now painted in it's nice Alaska flag livery and the Turbo Porter is as well converted to a B2-H4 version now. Tragic crash - Pilatus PC-6/B2-H4 # 922 PK-RCX of Associated Mission Aviation crashed yesterday near Wamena. Both pilots and 3 passengers did not survive the accident. My deepest sympathy goes to the families and friends of the involved persons. D-FELI with new ownership - Pilatus PC-6/B2-H4 # 845 is new owned by Sky Lease GmbH & Co. KG. G-BYNE with new ownership - Pilatus PC-6/B2-H4 # 631 G-BYNE is new owned by ASD SPRL operating at Namur (Belgium). F-HDEY with new ownership - Pilatus PC-6/B2-H4 # 735 F-HDEY is new owned by Thomas Schaub operating at Mainbullau (Germany) and Vercelli (Italy). Happy Anniversary PC-6 - Today, 58 years ago, the Pilatus Porter made it's very first flight. A memorable successful story followed and today, the "Pilatus Commercial 6" is still in production. Check out the milestones of the first 50 years in the HISTORY. F-GIBV modified to B2-H4 - Pilatus PC-6/B2-H2 # 651 F-GIBV of Alpes Parachutisme Services SAS / Baulip Sports is flying since March 2017 as a B2-H4. F-GOAG in a new look - Pilatus PC-6/B2-H2 # 658 F-GOAG of CERPS Maine & Val de Loire at Saumur received after its 14 years overhaul a wonderful new classic metal-black livery. F-GOSP with new ownership - Pilatus PC-6/B2-H4 # 699 F-GOSP is new owned by Sierr'Altitude based at Soulac sur Mer. F-GOME in a new look - Pilatus PC-6/B2-H2 # 543 F-GOME received after its 14 years overhaul by Icarius Aerotechnics a new smart black-silver livery. His new owner will be Thalilow at Merville. G-WGSC sold to Slovakia - Pilatus PC-6/B2-H4 # 848 G-WGSC has been cancelled in the british aircraft register and is new owned by Aeroklub Dubnica operating for Skydive Dubnica at Slavnica. The Turbo Porter will be registered in Slovakia as OM-FAA, the very first PC-6 in the OM register. G-CECI with new ownership - Pilatus PC-6/B2-H4 # 936 G-CECI is new owned by Pedro Leal and operated by Grupo 7Air for Skydive Seven at Portimao in Portugal. The Turbo Porter is named "Fly Taxi". CONTEST - Thanks for all your replies and the few correct answers in the contest about the former F-GUAS # 557 serving now as a house for happy chickens south of the alps - with some non-airworthy spares reused. V-615 is back as Piston - Pilatus PC-6 #635 V-615 of Swiss Air Force is ready for display in the Fliegermuseum Dübendorf as a Piston Porter. This aircraft was originally delivered in 1967, in 1980 converted to B2-H2M-1 and crash landed 29.01.2002 at Altenrhein. HB-FLA with new ownership - Pilatus PC-6/B2-H4 # 905 HB-FLA is new owned and operated by Scenic Air AG. New aircraft # 1011 - The factory new PC-6/B2-H4 # 1011 is registered now as HB-FBV (2) with Pilatus Flugzeugwerke AG. Tragic crash - Fairchild PC-6/C-H2 N5308F went missing on 30-Oct-2016 in the Lake Clark region of Alaska. Due to very bad weather the rescue team was not able to access the crash site earlier than six days later. Unfortunately the pilot and only person on board did not survived this accident. My deepest sympathy goes to the families and friends of him. New aircraft # 1010 - The factory new PC-6/B2-H4 # 1010 is registered now as HB-FBU (2) with Pilatus Flugzeugwerke AG. D-FFBZ with new ownership - Pilatus PC-6/B2-H4 # 869 D-FFBZ is new owned by WEYSA GmbH and operated by YourSky at Ganderkesee. New aircraft # 1009 - The factory new PC-6/B2-H4 # 1009 is registered now as HB-FBT (2) with Pilatus Flugzeugwerke AG. New aircraft # 1008 - The factory new PC-6/B2-H4 # 1008 is registered now as HB-FBS (2) with Pilatus Flugzeugwerke AG. F-GRCP with new ownership - Fairchild PC-6/B2-H2 # 2071 F-GRCP is new owned by Air 65, DZ Castelnau-Magnoac, France since May. The Turbo Porter is current in the 14 years check and will be soon ready again. New aircraft # 1007 - The factory new PC-6/B2-H4 # 1007 is registered now as HB-FBR (2) with Pilatus Flugzeugwerke AG. C-FZLZ on floats - Pilatus PC-6/B2-H4 # 972, registered as C-FZLZ with Louis Grenier, made it's first flight on floats last week. This first PC-6/B2-H4 registered in Canada is still wearing the livery of Thomas Air but in Mongolia the Turbo Porter never flew on floats. Tragic crash - Pilatus PC-6/B2-H4 # 634 D-FSCB crashed yesterday at Ferreira do Alentejo, Portugal. The pilot did not survive the accident, many of the seven skydivers are seriously injured. My deepest sympathy goes to the families and friends of the involved persons. Tragic crash - Pilatus PC-6/B2-H4 # 932 S5-CMB crashed today at Marina di Cecina, Italy. The pilot and the co-pilot did not survive the accident. My deepest sympathy goes to the families and friends of the dead persons. # 963 to become HS-WTF - Pilatus PC-6/B2-H4 # 963, current N963FP, is now due to be delivered by Seattle Aviation to Thai Sky Adventures in Sept/Oct 2016. The aircraft will be registered as HS -WTF owned and operated by Thai Sky Adventures and will be fitted with Beringer wheels and brakes and a 0 time PT6A-34 engine. HB-FMX cancelled - Pilatus PC-6/B2-H4 # 954 HB-FMX of Scenic Air AG has been cancelled in the swiss aircraft registers. The new registration will be EC-MMN with Skydive BCN. New aircraft # 1006 - The factory new PC-6/B2-H4 # 1006 is registered now as HB-FBQ (2) with Pilatus Flugzeugwerke AG. Yeti @ Aero - Pilatus PC-6 # 540 is displayed in these days at the Aero at Friedrichshafen. The piston Porter is painted in the same full livery as HB-FAN # 337 during it's Dhaulagiri Expedition back in 1960. 8 PC-6 delivered to China - The factory new Pilatus PC-6/B2-H4 # 992, 996, 997, 998, 1000, 1001, 1002 and 1005 had been cancelled in the swiss aircraft registers following its delivery to Asian Express General Aviation Wuxi Co Ltd.
HB-FNI cancelled - Pilatus PC-6/B2-H4 # 964 HB-FNI of Pilatus Aircraft Ltd has been cancelled in the swiss aircraft registers following its ferry flight to South Africa. # 972 with new ownership - Pilatus PC-6/B2-H4 # 972, originally delivered to Mongolia as JU-1911, is new registered as C-FZLZ owned by Louis Grenier. This is the very first PC-6/B2-H4 registered in Canada. The Turbo Porter has been flown to Switzerland just before christmas. N327SC with new ownership - Pilatus PC-6/B2-H4 # 946 N327SC is new owned by Medical Flights International LLC of Delaware in the US. The Turbo Porter has been flown to Indonesia in these days, with destination Papua. EC-KGD in a new look - Pilatus PC-6/B2-H4 # 677 EC-KGD operated by Skvdive Madrid is flying now in a new very nice silver-black livery. 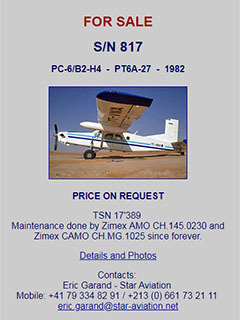 C-FZIZ with new ownership - Fairchild PC-6/B1-H2 # 2009 C-FZIZ is new owned by Louis Grenier used for Private flights. This Turbo Porter is registered since 1969 in Canada as CF-ZIZ, later C-FZIZ. Tragic crash - Pilatus PC-6/B2-H2 # 786 GN-804 of Gendarmeria Nacional Argentina crashed yesterday at Las Heras. All on board, the pilot and the co-pilot, did not survive the accident. My deepest sympathy goes to the families and friends of the dead persons. # 341 with new ownership - Pilatus PC-6 # 341 N4795P is new owned and operated by New York Flight and Skydiving Club LLC. This is one of the last 3 remaining piston powered PC-6 worldwide! New aircraft # 1004 - The factory new PC-6/B2-H4 # 1004 is registered now as HB-FJI with Pilatus Flugzeugwerke AG. This aircraft is the new factory demonstrator. Wing of V-611 found - A wing of Pilatus PC-6/A-H2 # 530 V-611 operated by KTA at this time, has been found on the Tschiervagletscher. The accident debris has been released by the glacier 50 years after the accident of V-611, which has been salvaged and later repaired with new wings.
! WARNING: SET CORRECT TRIM BEFORE TAKE OFF ! documents, photographs or stories of any PC-6 - can you help me? I would appreciate your contributions, comments, suggestions or requests. Copyright © 1999-2019 by Markus Herzig. All rights reserved. No content of this site may be used without prior permission.